To keep my mind off the depressing news, I try and find projects. I love to cook but am limited these days with ingredients so once again I have to be creative. (and cheap) I love to decorate, but these days I shop second hand stores and look to embellish old broken down pieces of treasure. For years now, when a favorite shirt, blouse, dress, or skirt gets old if it is of material that I just love (and can't part with) I save it. For a future pillow, some table napkins, place mats, gift bags - whatever I yield after it is cut up. I've not made a quilt yet. Tomorrow I have a rare Wednesday off so I am thinking about getting out my sewing machine and scrap material and sewing up some simple curtains for my dining room and kitchen.Right now I have those vertical blinds (this used to be my parents home) and they loved them. They serve a purpose, especially in the hot summer when it gets to 105+ - just doesn't look all that fashionable. Very sterile looking. So what I plan to do is make some drapery that slides over the blinds and to the side, when the blinds are open. I can live with that! Embracing life is a good thing to do! 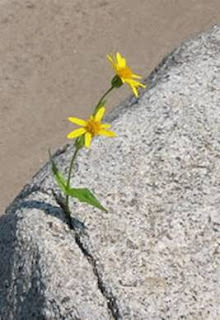 It is hard to bloom where one is planted, but I think we need to make the best effort we can to do so. Cutting back on our income cut back on our going out to eat as much as we used to. We bloomed by trying new recipes and new ingredients like eggplant. For you, blooming can be creative with your sewing machine with what is available around you!